This is the fourth of six reviews of Bulgarian wine this month, and the first of two by Bessa Valley Winery. Those wines by Bessa Valley are this 2008 Enira and their 2006 Enira Reserva. The Bessi were a tribe of Thacians. The Bessa Valley within the Thracian Valley of the Thracian Lowlands is their namesake. 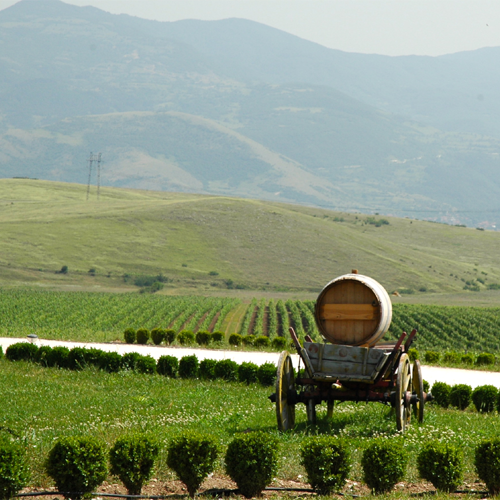 Bessa Valley Winery was founded in 2001 when 800 properties were purchased for its creation. German Count Stephan von Neipperg, owner of Bordeaux's Chateau Canon La Gaffeliere and La Mondotte, assists with the winery's production. The Count wanted to be a part of bringing quality wine back to Bulgaria. He's quoted as saying "I’ve chosen Bulgaria because of the magnificent terroir. 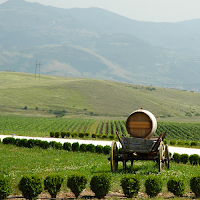 With Enira we revive the image of the Bulgarian wines worldwide." 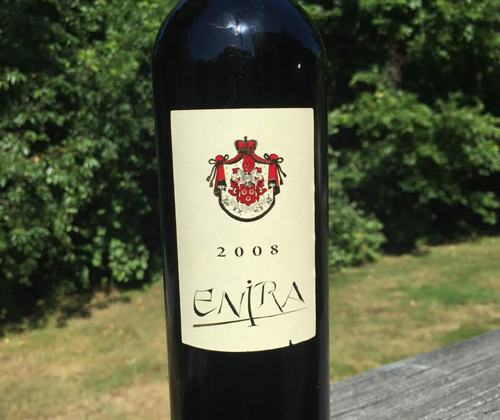 The 2008 Enira is 48% Merlot, 40% Syrah, 7% Petit Verdot and 5% Cabernet Sauvignon. It's hand harvested and further hand selected on tables. Whole grapes are cold macerated for five to eight days, fermentation is done with selected yeast strains, and it's further macerated in concrete tanks for five to eight days. Then it goes through malolactic fermentation and put in oak barrels for a year of aging. The color of the wine is a brick red. The nose gives a loud, primal scream of hazelnut, cassis, plum, black olive and sweat. The Merlot and Syrah work wonderfully together on the nose. On the palate it's pretty straight forward with flavors of cassis, plum, hazelnut and just a drip of soy sauce. It's medium to full bodied, finishes with an earthy quality, and has a long lasting, saliva stripping tannin. This wine with a ribeye steak, potatoes and asparagus would be frickin KILLER. It's not all that complex but it's solid in character and solid in structure. If I had this guy in my lineup at work I'd be luring the "I only drink Cabernet" manly-men over and talking it up. They'd love it. It's usually $26 but, at the time of this review, it's on sale for $21. Take advantage!